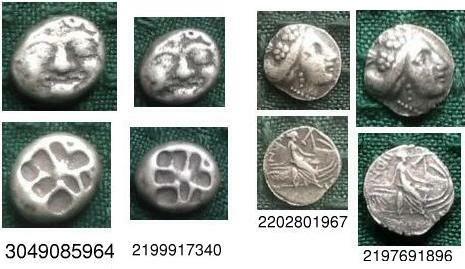 The silver units of Parion in Mysia are perhaps the cheapest Greek silver available on the coin market. Genuine examples in low grades are easily obtained. The two coins below sold on eBay in November 2003 for $10 and $17. Both coins are off center in exactly the same way, have exactly the same reverse alignment, and even have a dent in the same place (4 o'clock on the obverse). Unexpected raised bits of metal (not dirt) can be a sign of casting (metal flows into bubbles in the mold.) The first coin has an obverse pimple, the bright spot just right of the center. That coin's reverse has several spots at around 5 o'clock. The second gorgon has 'caught measles,' but it's reverse has no obvious spots. The two coins share the same coloration: black on the low areas, and light brown 'mud' within the incuse. The second coin has light brown patches in the lowest areas on the obverse as well. Weights are less than typical, but not lower than some genuine ancient imitations. Interestingly, the first coin is 2.82g but the second is over 1/5 of a gram less at 2.61. Cautious buyers should purchase from dealers who give lifetime guarentees of authenticity. These specimens came from ClaireCoins (Gregory Gregorov.) Mr. Gregorov pulled his current Parion eBay auction item and offered me a refund after seeing the photos above. I urge collectors who are worried about fakes to always buy from dealers with good return policies such as Claire. 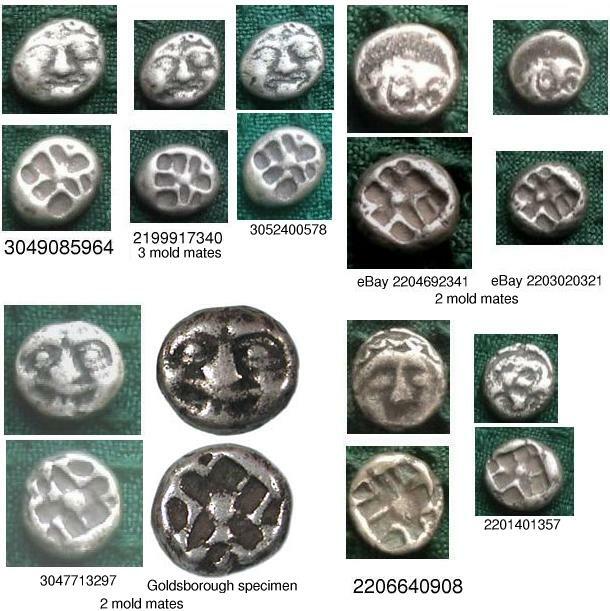 I inspected completed Greek AR auctions on eBay by this dealer and found other coin pairs which appear to be different coins but share the exact same shape. The Histiaia tetrobols sold in the $20-$24 range. The rim, at the 8-o'clock position on the reverses of both coins, is worthy of your attention. A very high resolution image (~2400 dpi) of a Parion drachm. The appearance of the black toning at high magnification is quite interesting. 'Die study' of the cast Parion drachms and of the cast Histiaia tetrobols. 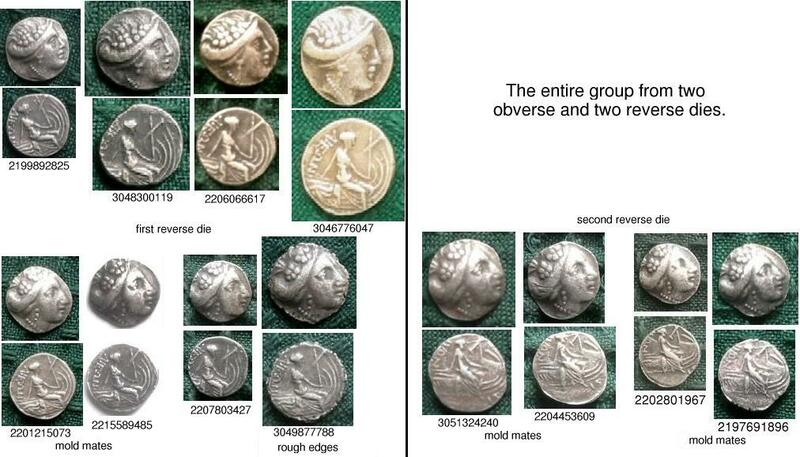 None of the Histiaia and only three of the Parion coins were inspected personally. I compared the coins by the shapes they show in their photos. I would like to thank Reid Goldsborough for his advice and for sharing with me a similar Parion coin he purchased from the same dealer one year before.